Super Hostel direkt im Zentrum. Gemütlicher Aufenthaltsraum mit Küche und nette Leute. The hostel is really cosy!! Wonderful hostel, great & friendly staff! I will come again. 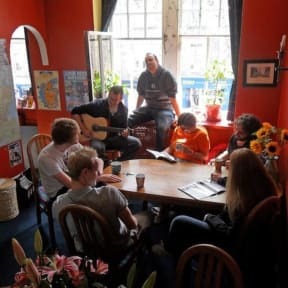 If you're looking for a small hostel with a great community atmosphere you've come to the right place. RMB offers everything you can wish for to make you feel at home right away. It's a little bit nerdy but not over the top, staff is super friendly and helpful. They have an open fire place to chill out at in the evening and the rooms are huge compared to other hostels and very comfortable. Also, as a bonus, they have a cool book exchange :) will definitely come back! Tolles Hostel, ausgefallene Namen für die Zimmer und die Betten, gute Empfehlungen für Pubs in der Nähe. Das Hostel ist super gelegen, würde jederzeit wieder dort übernachten. Location perfect! Top staff and kitchen!